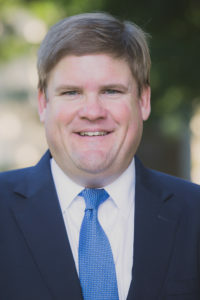 James R. White, an associate attorney with Shanahan Law Group, PLLC, recently began a three-year term as a member of the N.C. Bar Association’s Real Property Section Council, which deals with numerous issues affecting real property practice in North Carolina. White concentrates his practice in the areas of commercial real estate, buyer and seller representation in real estate transactions, borrower and lender representation in commercial loans, general corporate representation and formation, trusts & estates, banking, financial services and real estate litigation. As the N.C. Bar Association’s largest section, the Real Property Section is actively engaged in legislation, publishing and other matters involving real property law. The section drafts, monitors and comments upon state and federal proposed legislation and regulations affecting real property practice; monitors and comments upon State Bar ethics inquiries; sponsors and participates in pro bono projects; provides variety of CLE programs; conducts aggressive consumer protection/authorized practice program; hosts active electronic discussion list; periodically updates and republishes forms book; and oversees NCBA copyrighted real property forms. For more information, visit https://ncbar.org/members/sections/real-property/.